Spend a tropical Christmas in Malta this December and enjoy a special treat. A celebratory holiday for the Maltese, the island offers a unique opportunity to experience the unique cultures and traditions of the Mediterranean nation. Rooted in British and Italian customs, a Maltese Christmas is typically set in great weather, and comprises of a number of distinctive festivities and mouth-watering cuisines. Street Walks: Get outdoors and enjoy the local celebrations. Take a walk down the streets of Malta and explore the many delights available just by stepping out your door. Littered with stunning Presepju displays, the Maltese version of Christmas cribs, just about every street corner promises a magical nativity scene for the wandering tourist. Christmas Shopping: Besides the many exhibitions and cultural highlights of spending Christmas in Malta, the long shopping hours are an added bonus for those last-minute gift and grocery runs. 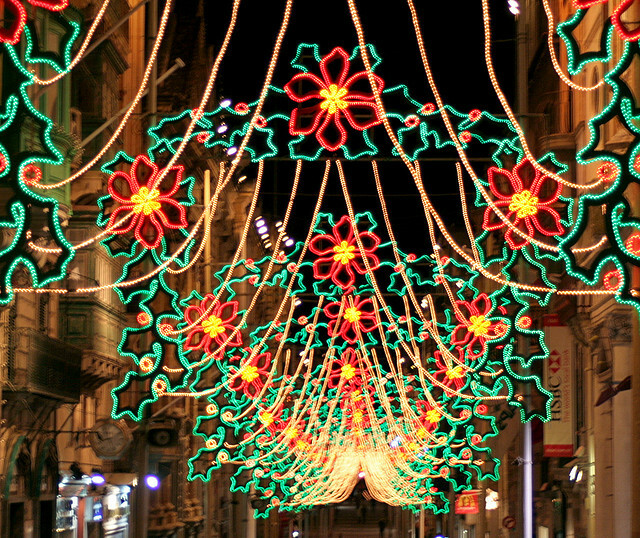 Valletta shops are known to stay open as late as 9pm during the countdown to Christmas day. Midnight Mass: Christmas in Malta is a largely religious affair. Apart from the dazzling Presepju displays, tourists can also attend midnight mass, which is largely attended by Maltese locals. Sing Christmas carols and get into the family spirit of the occasion. A great means to see the island’s trademark churches lit up and beautifully decorated, the midnight mass is an absolute must if you’re in Malta over December. Cuisine: Catering to the tastes of foreigners and locals alike, Malta’s Christmas cuisine is a polarised menu of western delights and local delicacies. Enjoy a popular westernised lunch of turkey, casserole, mince pies, Christmas cake and pudding, alongside traditional Maltese treats like their chestnut and cocoa soup (Imbuljuta tal-Qastan) and their treacle honey rings (Qaghaq ta' l-Ghase), which are consumed in abundance. Weather: Lastly the weather in Malta is a lot milder than neighbouring Northern Europe, which endures the big freeze during December. Spend Christmas outside enjoying warm temperatures of 16-22 degrees during the day. While the nights can be rather chill, tourists will forego Malta’s winter season, which only starts in January. A country that was founded on Catholicism, tourists can expect to see a diverse mix of spiritual festivities and popular activities. With something for everyone in Malta’s modern day take on merrymaking, the island is the perfect Christmas extravaganza of relaxation, tropical beaches, and jovial elements over December. The ideal destination for families and individuals looking to end 2012 on a high note; travel to Malta this Christmas for a memory of a lifetime and reason to return next year. Bella Gray is a lifestyle blogger from who loves reminiscing about her Malta holidays. A travel guide for tourists looking to go abroad, Gray is the perfect go-to-gal for all your holiday advice and travelling solutions.